The Westin Hilton Head Island Resort was our destination for a recent family trip. This sprawling property is part of Port Royal Plantation on Hilton Head Island. 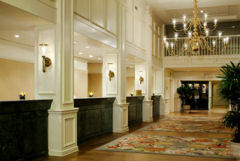 I believe that everyone can have a great vacation experience at the Hilton Head Westin Resort. The upscale atmosphere will appeal to adults and there is enough fun to please children as well. Pools at the resort are beautiful. Westin Hilton Head has a program of planned childrens activities but our kids seemed to prefer the open ocean as their playground on this Hilton Head vacation. The beaches at the Hilton Head Island Westin hotel are clean and quiet. The rooms at the Westin Hilton Head Island have private balconies and the views are stunning. 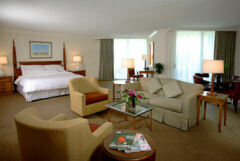 I thought that the amenities provided were very well chosen and we had everything that we needed. The Hilton Head Westin suites are guest rooms that give you a little more space, and this is why we had selected a Carolina King suite. Our Westin Hilton Head room reminded us of a beach house and we all loved it. There are cribs and rollaway beds on call if you have younger children. 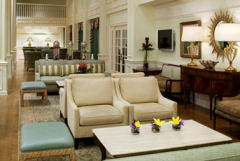 An onsite entertainment center at Westin Hilton Head Resort provides snacks and coffee or tea. You can also choose some movies to view in your room. 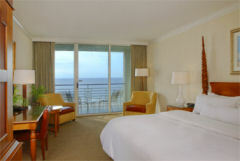 Hilton Head Westin guests can enjoy a variety of music selections or video games. 24 hour room service is provided 7 days a week and we had midnight snacks delivered several times. The outdoor deck at the Hilton Head Island Westin hotel gives you a perfect place to view the ocean. The round tables are topped by brilliant blue cloth covers and are wonderful places to grab a bite of food or enjoy a frozen drink. Turtles Poolside at Westin Hilton Head will cater to guests who dont want to interrupt their time in the sun. Servers will bring snacks and cold drinks to you during the day. We really enjoyed the casual atmosphere at the Westin Hilton Head Island Carolina Café. 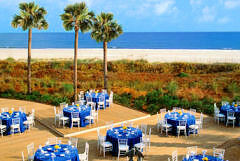 This Hilton Head Island Westin hotel restaurant is onsite and is very family friendly. This is one of the favorite places for hotel guests and island locals to eat. The Café advertises that they have the best seafood feast on the Island and I will have to agree that the food there certainly backs up their claim.